Well, it's GAMETIME once again here at Tracksounds! Once a year, we like to get our game (music) on around these parts...and we like to bring you along for the ride. 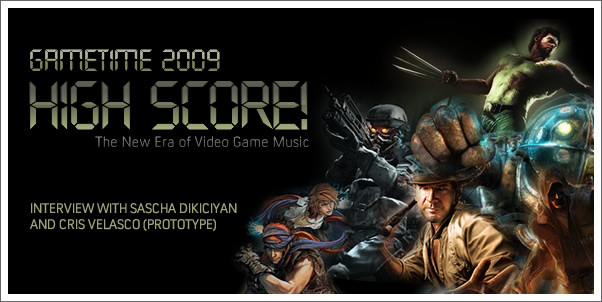 This "new era" of video game music continues to provide, not only gamers, but many traditional fans of film music, with hours of experiential music to feast upon. Video game titles are getting at least as much attention as major feature films these days. People are hunting for every tidbit of information they can scrounge up on their favorite game franchise. We are waiting for hours in line to be among the first to dive into a new gaming world or back into a world we have devoted countless hours to already. The world's love-affair with video games continues to grow and in the answering of such great demand, comes a lot of exciting music that should not be overlooked. High Score! exists to put the spotlight on some of this great music. To launch things, we have a great podcast interview with composers Sascha Dikiciyan and Cris Velasco who share about their most recent collaborative work for the video game, PROTOTYPE.